Hong Kong, October 2nd, 2018: Hong Kong’s only contemporary art fair in the Fall, the Asia Contemporary Art Show, closed its 13th successful edition on Monday evening October 1st. Over four days, the Show welcomed more than 15,000 collectors and art enthusiasts (8% higher than the record-breaking attendance last Spring), with crowds swelled by visitors from China on National Day, with many taking the recently opened 20-minute high-speed rail from Shenzhen to Hong Kong. 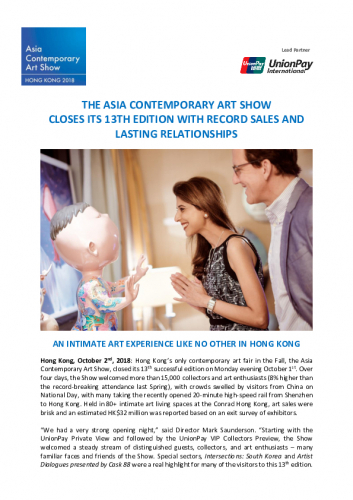 Held in 80+ intimate art living spaces at the Conrad Hong Kong, art sales were brisk and an estimated HK$32 million was reported based on an exit survey of exhibitors. “We had a very strong opening night,” said Director Mark Saunderson. “Starting with the UnionPay Private View and followed by the UnionPay VIP Collectors Preview, the Show welcomed a steady stream of distinguished guests, collectors, and art enthusiasts – many familiar faces and friends of the Show. Special sectors, Intersections: South Korea and Artist Dialogues presented by Cask 88 were a real highlight for many of the visitors to this 13th edition. In-depth conversations and new discoveries were made over the weekend, with the Show partnering with ZAI ART APP - China’s leading digital art platform with an audience of over 2.3 million collectors and art enthusiasts. A live panel of experts explored why people buy and collect contemporary art. Art thought leaders took several thousand ZAI ART APP subscribers on live tours of the Show. The Asia Contemporary Art Show would like to acknowledge and thank art patrons UnionPay International, Macey & Sons, Cask 88, Royce Cellar, HK Liquor Store, Connecting Myanmar and FIJI Water; as well as hospitality partners Bernard Magrez, Leaf Tea Boutique, Samuel Adams and Magners Irish Cider for their support. As a long-standing pioneer in art brokerage and auctioneering, Macey & Sons advise clients on starting and expanding their art collection, enabling them to make steady returns on their art investments. With a rich and varied portfolio sourced from around the globe, from blue-chip Chinese contemporary artists to traditional ink, iconic legends to rare collectibles, Macey & Sons specialize in sourcing and trading art in both the primary as well as the secondary market. Macey & Sons help clients invest in alternative assets with high appreciation potential and advise in resale options and various exit strategies. Situated in the heart of Lan Kwai Fong, Macey & Sons invite you to contact them by any means and arrange a private consultation with their expert team of professional advisors. The 14th edition of the Asia Contemporary Art Show at the Conrad Hong Kong will be held on March 29th - April 1st, 2019during Hong Kong Art Week! The Show is limited to 85 galleries from Asia and the world and will feature two popular sectors, Intersections: China, the fourth in a series that will focus on the conceptual crossing of artistic ideas, and Artist Dialogues, dedicated to solo and joint artist presentations.